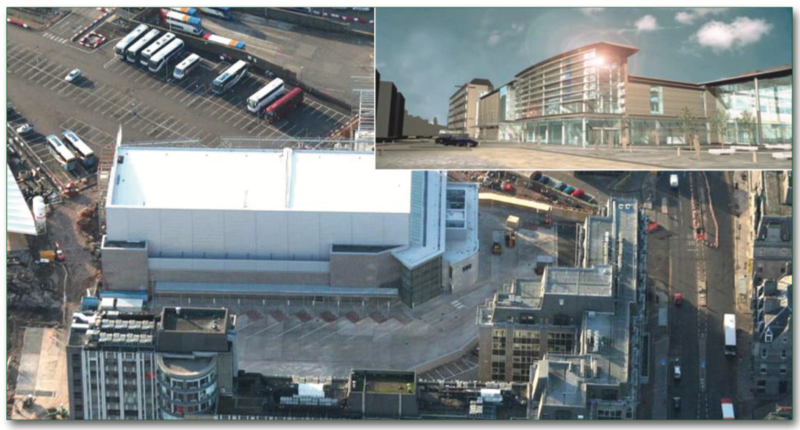 DBA prepared a Transport Assessment of a mixed retail/leisure development comprising 48,000m2 GFA in Aberdeen City Centre, and a major expansion of the existing City Rail and Bus stations. Passenger and vehicular access to rail and bus stations was designed as well as the operational bus station layout. Studies included an accessibility assessment by all transport modes, particularly pedestrian links to the City Centre (Union Street). A package of measures was devised to accommodate the development including improvements to pedestrian and cycle routes and a significant extension to the City Centre linked signal control system. City Centre parking surveys were conducted to establish current levels of capacity and predict additional development parking required without encouraging additional commuter trips. A Transport Plan Framework was produced, including a car park management regime. DBA produced detailed network analysis; carried out detailed traffic signal design; undertook the development of layout / design drawings; prepared bus station design layouts assessing manoeuvrability of vehicles and of servicing and access areas including service yards and car parks.